The very first Overcooked which released a few years back was a big hit in my house, with me and the daughter having some decent times on it while reviewing it, and it also going down rather well with anyone that gave it a look. With the sequel now available, of course, I was going to reach out to Team17 and ask to review it. What does this new game offer? Is it worth picking up if you have the first game? Let's see, shall we? 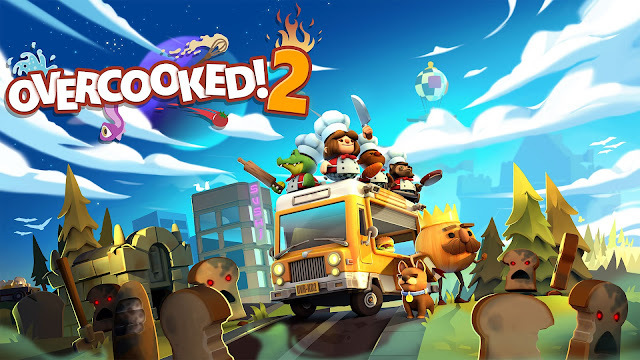 Overcooked 2 takes what was already a great local player co-op game with the original and instantly improves on it the second you get to the menu and see that online play is now also possible. All modes now have some sort of online element to them, which really does make the game a whole lot easier to enjoy if you perhaps lack when it comes to having gamers in your house willing to play it with you, as it really does shine Overcooked in a much better light when adding more people. The modes in the game are all simple and don't need that much explaining, with story mode having you take on the Unbread, yes that is bread brought back to life. in which you must travel around in your little minivan (the food truckster 500) to new kitchens which have brand new recipes to defeat this stale bread and save the kingdom. If you played the first game it's pretty much the same deal. Load up a level and just try and get 1 to 3 stars to complete it by making as many orders as you can with all the tools and food you need scattered around the kitchen to move on to the next kitchen. With simple controls, even kids can soon pick this up. With this being a great game for parents who want to spend a bit of gaming time with their little ones. Of course the kitchens you prepare the food in don't make it too easy, with the ones this time around much better in just design over the first set of kitchens in the first game, even though they were alright too. Like I said earlier, you can play this online, but you can only play story online by inviting friends in, with the option to play with random people not there. You can play it locally though, and this of course not only makes it easier when it comes to later stages but also throws in more fun too. Second mode is Arcade, with this one offering local play, online public, and online private games too. Here you can pick a theme and try your best to score as best as you can on it. These are levels you have taken on in the story, so nothing new here other than the chance of playing them with random people thanks to online. Finally, we have versus, where once again you can play it local play, online public, and online private. Here you are trying to beat the other person by preparing and getting out more orders than them, so it certainly adds to the tension and rage if you got that in other modes. In terms of unlocks, you unlock new chefs to use as you play through the story, which while not having anything unique to them other than looks, they do add to a decent cast of characters to play with. 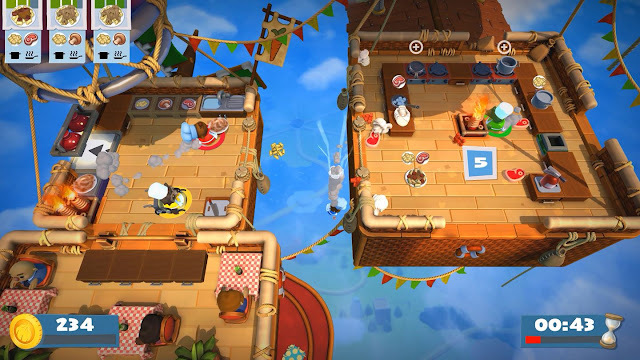 Overall: Overcooked 2 takes what was already one of the better local play games and improves on it by adding online play, new recipes, and just adding more to what was already a fun/crazy game to play with loved ones and now random people on the Internet. Easily one of the best party type games released so far this year, and worth checking out if you have kids or just fancy playing something that is a bit different to mix things up a little. Sounds like what a sequel should be. Take what made the first game great and improve upon it in as many ways as possible.